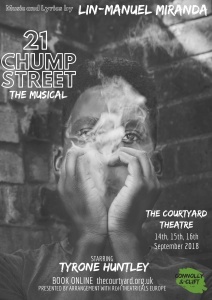 Casting has been announced for a new production of Lin-Manuel Miranda's 15-minute musical, 21 Chump Street, which runs at The Courtyard Theatre in Shoreditch, for just three nights from 14th-16th September. It premiered at the Brooklyn Academy of Music in 2014 and is based on an episode of the radio programme This American Life about Justin – a high school senior who falls madly in love with new girl Naomi Rodriguez. He won't give up until she goes to prom with him, and he'll try anything to impress her, including buying drugs from the cool kids. But Naomi has a secret. She's an undercover cop. . .
Cedric Neal (Chess, Motown) will play the Narrator with Tyrone Huntley (Dreamgirls, Jesus Christ Superstar) as Justin, a high school senior who falls in love with new girl Naomi Rodriguez – played by Melissa James (Eugenius!, The Bodyguard). 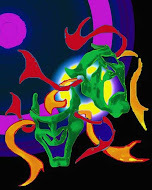 They will be joined by Matthew Caputo, Shiv Rabheru and Miles Barrow. Directed by Lizzy Connolly (Dirty Rotten Scoundrels), the performance has musical direction by Ed Bussey and choreography by Simon Hardwick and will be followed by a 'prom' with a live band and vocals from Cedric Neal.